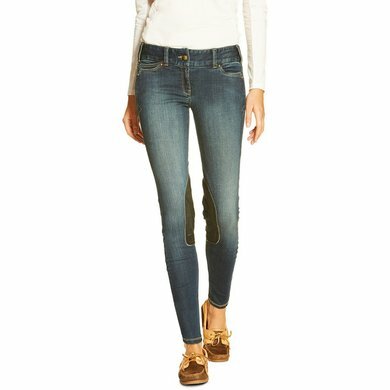 Worn as a legging or as riding pants these pants are ideal for sporting. The pants are made of premium stretch cotton with synthetic suede knees. The pants have a medium wash. The pants are fitted with front and rear pockets. Also, the pants have traditional jeans styling details which distinguishes him from other riding pants. Extremely comfortable fit and soft material ... which unfortunately rubs off. I hope after repeated washing the problem is settled. Sit nice, nice short legs, if you do not have such long legs. Size is good, nice cool pants. 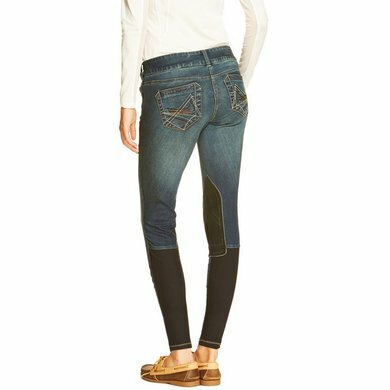 Answer: The first size indicates the jeans size, the second size indicates the size that we are used to with riding breeches. Question: What is the difference between an R and an L? Answer: R is regular, that is normal length. In other words, length limit 32. L is lenght, which is extra long and comparable to length 34. Question: How do the sizes of these pants work? 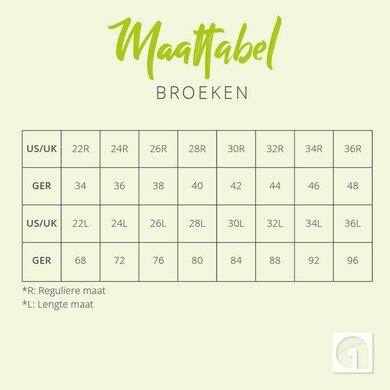 Answer: Size 28/38 corresponds to jeans size 28 and clothing size 36, size S / M Size 29/39 corresponds to jeans size 29 and clothing size 39, size M Size 30/40 corresponds to jeans size 30 and clothing size 40, size M / L Size 31/41 corresponds to jeans size 31 and clothing size 41, size M / L All these pants are extra short, in jeans length measure this corresponds approximately to size 30-32 length.